A new dinosaur fossil discovered near the city of Qijiang, China by construction workers. It is estimated, the dinosaur given a name Qijianglong guokr was lived 160 million years ago. The plant-eating dinosaurs had an unusual stature, half of the body is the neck. It has a body length of about 14 meters, and the neck of dinosaur's has a long of 7 meters. The construction workers along with paleontologist lift the dinosaur fossil carefully. They managed to lift the head complete with ancient animal's neck. 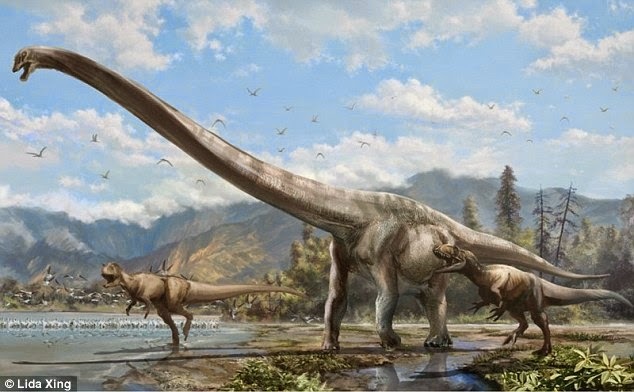 "It is a rare, that the head and neck of long-necked dinosaurs was found together because his head is very small and easy to separate after the animal died," said Tetsuo Miyashita, a scientist who involved in the excavation. "Qijianglong is cool animals," said Miyashita who is a paleontologist at the Univerity of Alberta. "If we imagine the animal that half of the body is the neck, you can know that evolution can take place with very great," he said as quoted by Discovery on Friday, January 30, 2015. Dinosaurs of Sauropod type also had long neck. However, usually only a third of its length. Thus, the Qijianglong was very special. Qijianglong guokr had an interesting anatomical adaptation. Bones have many cavities. So, despite the long-necked, the dinosaurs would not feel sore. However, the neck remains strong. Animal's neck was estimated more moves up and down rather than to the right and left. Qijianglong guokr classified as type Mamenchisaurus. The type found only in Asia. Dinosaurs with extreme long necks itself can only be found in China, it shows that this dinosaur type had experienced the isolation.